The Naucrates 130: 40 metres sea SUV, off road or offshore? This model is the natural evolution of its predecessor, Naucrates 88. Naucrates 130 is developed on a larger scale to satisfy the requirements of customers who want new ways of exploring the world’s seas and oceans. Certified to the most rigourous construction and safety standards, the this yacht can comfortably tackle all sea conditions. The conformation of the vessel makes sailing incredibly stable, even if the stabilising system is not working. The construction is in aluminium and steel, the shapes streamlined, the design of the windows and the elaborate superstructure give a gracious but modern and aggressive look. Green Yachts Design Studio has created a design with harmonious geometry. 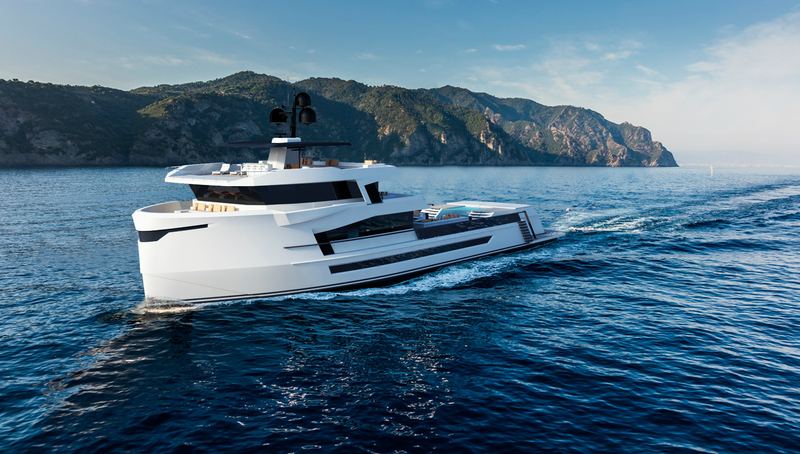 The Naucrates project started almost by chance, with a meeting between Cantieri di Chioggia and Green Yachts Design Studio. The general manager of the studio, architect Mattia Massola Taliacarne, said: “When I met the owners of Cantiere di Chioggia and saw the production yard and the boats, I fell in love and decided to propose to them a design different from the ones they usually offered. As in all things, in design too there is personal evolution and I underwent this process, I must say very willingly. I went from designing streamlined boats that were high performance also in their shapes to appreciating displacement sailing that was calm but safe in all conditions. I like the idea of sailing with a boat that can tackle all conditions, of being always safe. A jeep of the sea? A SUV! And so together with the owner of the yard we designed the Naucrates“. And so this project came about by a chance meeting of people, professionals and designers. Like crossover cars, Naucrates was conceived following to design pass, one concerning the technologies and structure of the vessel itself and the other concerning a design that would mark out a precise and unique aesthetic and functional project. They are “vehicles” designed in detail to respond to the stresses of their context; woods, unpaved roads and off road use for cars, and impervious conditions, high seas and big waves for boats. 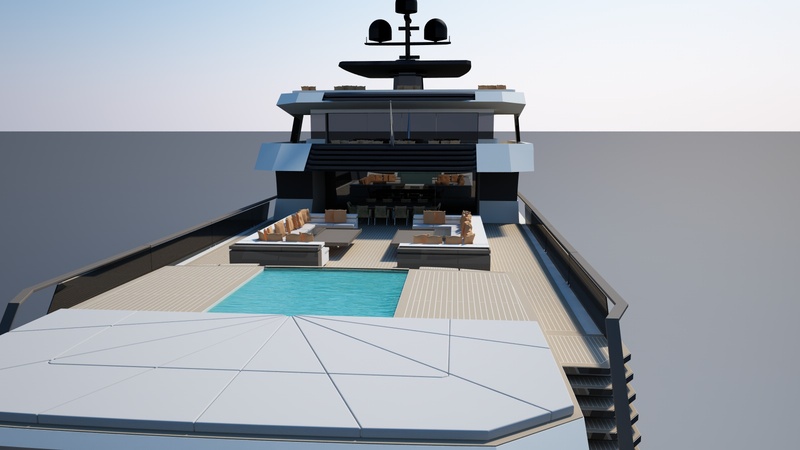 Naucrates 130 is a powerful and massive vessel, designed with original but perfectly balanced harmony. A unique feature is the beam, which is unusual on vessels of this size that guarantees exceptional interior volumes, unique space on the decks and incredible transverse stability. Thanks to its conformation Naucrates 130 can tackle quite comfortably any sea and weather conditions, thanks to a beam of more than 10 m (a unique feature), it has exceptional roles stability even with the stabilisers turned off. It has a hull in steel with a double bottom and integrated tanks. The double bottom extends from the collision bulkhead to the transom, except for the area where the engine room is located. Construction and welding conform to the highest standards of naval construction and meet R.I.N.A. regulations. The interior bulkheads are fully isolated up to 3 1/4 inches for maximum soundproofing and all cabins are thermally insulated, including the hull. The insulation and soundproofing of the engine room comes from a material based on mineral wall with a density of 50 kg/m³ and a thickness from 50 to 100 mm according to requirements. Green Yachts Studio has created harmonious geometries that fit well together, creating count and rounded surfaces to accompany glass inserts. The broad stern area with its perimeter bathing platform is original and unusual for a yacht of this size. It is accessed by a practical ladder in teak with a very characteristic design, that winds around the side of the swimming pool creating a kind of island or stern castle with a beach all round. The swimming pool can be covered and the entire area, including the sunbathing area, can be used as a helicopter landing pad. The gunwale is in tempered structural glass, which protects guests but at the same time gives them a good view of the sea and the coastline. The wide lateral strip on the side, which is slightly resurfaced, ensures optimal lighting also for the guest areas on the lower deck. The main deck is full beam, to give even more living space if it were needed; on this deck is a roomy living room and dining area.